Experts@Ekya is a monthly event where the school invites experts from diverse fields to speak to our students about their work. Experts who have made their mark across the spectrum of professions share their experiences and talk about their careers. Through these interactions students understand that there is a difference between the underlying passion involved in being a profession that one really likes and the one that is forced upon them. Be it writing a story, making advertisements or short films, architecture, growing up or any topic of interest, through these talks, students realize that success is the result of the pursuit of excellence, hard work, dedication and commitment. Our students learn to formulate and ask relevant questions, engage with public speaking, and develop a sense of curiosity about the world. 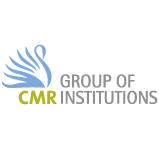 Through this program, we want to help our students make responsible career choices in the future. Students of Ekya had the privilege of meeting an individual who had passed the limits of running, that most would not dare to do. Mr. Taher Merchant is the first Indian man to complete the 60km Extreme Ultra – Everest Marathon. An Ultra Marathon is one of the hardest stamina based running event, surpassing the distance, terrain, and other challenges of a regular Olympic marathon event. Sharing the “best experience of his life” with our students, Mr. Taher spoke of his preparation for the grueling race, the adversities he faced during the event and how he beat them. He concluded his inspiring talk by highlighting the importance of discipline, dedication, and smart work for achieving one’s goals. 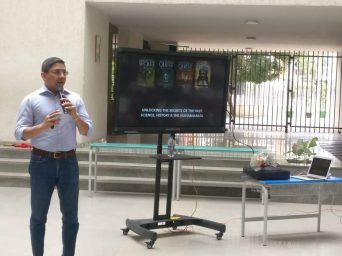 The students of Grades VI-XII had the wonderful opportunity to meet and interact with Mr. Christopher Doyle who has authored the popular books the Mahabharata Secret, The Mahabharata Quest Series and his latest release The Son of Bhrigu. Mr. Doyle’s books are known to transport the reader into a fascinating world where ancient secrets buried in legends blend with science, history, and fantasy to create a gripping story. 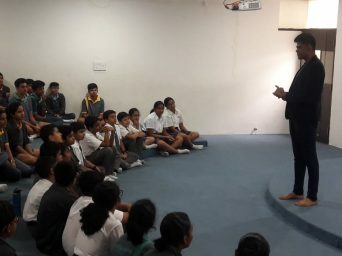 At the expert talk, Mr. Doyle narrated tales about myths and legends from across the world, also taking our students through the process of writing a bestseller. Following his talk, he signed copies for our children and answered their questions through an interactive Q&A. Exploring delightful recipes of pure indulgence. Ms. Neeth Medappa from Pastry Masterclass, organized Baking Workshops as part of the Experts@Ekya program. A trained French Pastry Chef from Le Cordon Bleu, Ottawa, Canada, Ms. Neeth has had over 300 enthusiastic bakers in attendance at her signature baking master-class, organized in Coorg and Mysore. 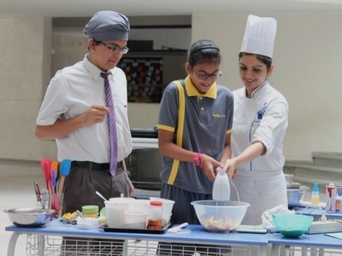 Young, budding bakers now enjoy the same experience with Ms. Neeth’s student-friendly ‘Junior Pastry Masterclass’. Internet safety and the future of jobs. How do startups work? How is your data being used by companies? What and how will jobs look like in the coming decades? How to be safe while using the Internet? Answers to these questions were delivered by Mr. Manikantan, who was hosted by our students as part of the Experts@Ekya programme. Currently serving as the Chief Technical Officer, Asia Pacific and Japan Region for Abstream Technologies, Hong Kong, he is also leading a corporate social responsibility initiative with an objective to train Indian youth on enterprise technology, the tech which is runs and connects all businesses today. 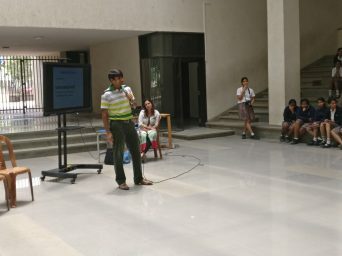 Mr. Manikantan’s interactive session helped the children understand how the world functions and how it is shaping up to function in the future. Click here to read more about his talk. Jack of all trades but master of at least one. 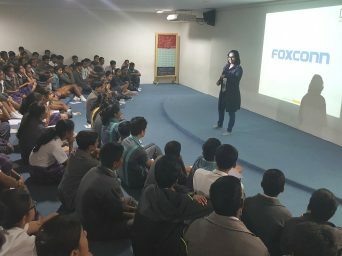 The brain behind Yellow Collar Careers in India, Ms. Mala Martina established the program through her organization, I Love Mondays, which helps teenagers do what they love, lets them know how to become really good at it and connects them to the right people to become successful. At her talk, our students learned to distinguish between the Blue collar, White collar and Yellow collar jobs. Ms. Mala spoke about the traits of a yellow collar job, namely competency, doing what you love, the dominance of the right brain, being a jack of all trades but master of at least one and developing empathy. Know more about her talk here. Taking a closer look into cardiology. 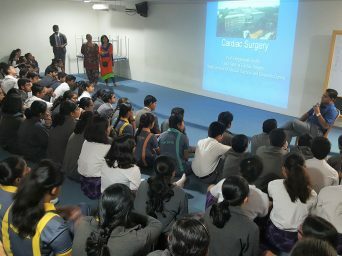 Currently, the Head of Cardiovascular and Thoracic Surgery at Vydehi Institute of Cardiac Sciences, Dr. B Durgaprasad Reddy’s session was aimed to raise awareness among our young children, about the effect of toxic habits on the cardiac system and their implications. Videos of cardiac surgery were the also highlight of the interactive session as our students got a glimpse of a beating heart inside the thoracic cavity. Dr. Durgaprasad has been across the country and the globe, undertaking workshops and presenting papers and has addressed 10,000 medical cases. Adding to his credit are the number of awards he has won including the Paul Harris Fellow Award from the Rotary Foundation International and an Excellence award from the Minister of Health. 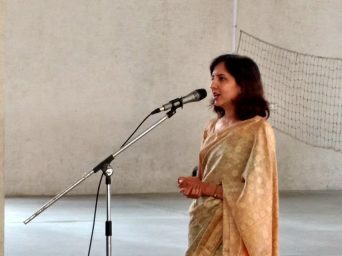 Ms. Reshma Krishnamurthy joined us at Ekya to talk about ‘Alternate Careers and Offbeat Careers’. An established entrepreneur, Ms. Reshma founded ‘Moms and Stories’, a platform that publishes inspiring stories on stay at home mothers, women athletes, acid attack survivors, mothers who blog or have a love for adventure, mothers with physical disabilities and children with special needs. Adding to this, she has been a writer, radio jockey, and communications manager. Having addressed our students from Grades VI to X, Ms. Reshma conducted an interactive Q & A with the children.